We love knowing that everyone’s safe whilst out on the road, so thought a helmet was the perfect thing to give away to a lucky winner. This will be perfectly complimented by a new Principal Perk that is being launched next week. Look out for news of this from Principal at the MCN show at London’s ExCel starting on the 17th February. With the first of the year’s bike shows opening this month and the weather is getting warmer you can feel the start of another biking season is fast approaching. And what better way to start it off than a new bit of kit? So give us a call now on 0333 241 3475 (UK) or 1800 945946 (ROI) and see why over 30,000 customers now trust us to insure their story. What’s yours? *Terms & Conditions apply. See below. 1. The prize draw (the “Prize Draw”) is open to people aged 16 and over who provide their email address when phoning Principal Insurance in the UK and Ireland for a motorcycle insurance quote. E-mail addresses provided by completing an online quotation at www.principalinsurance.co.uk will also be included in the prize draw. Enquiries from insurance aggregator sites (Eg: Go Compare) will not be included in this promotion. Employees or agencies of Principal Insurance Ltd (“Principal”, “We”, “Us”) its group companies or their family members, or anyone else connected with the Prize Draw may not enter the Prize Draw. By submitting your personal information you agree to receive emails from Principal Insurance Ltd containing offers and news that we think may interest you. You will be given the opportunity to unsubscribe on every email that we send. To enter the Prize Draw you must obtain a motorcycle insurance quotation – by telephone or online – and provide us with a valid e-mail address. No purchase is necessary. 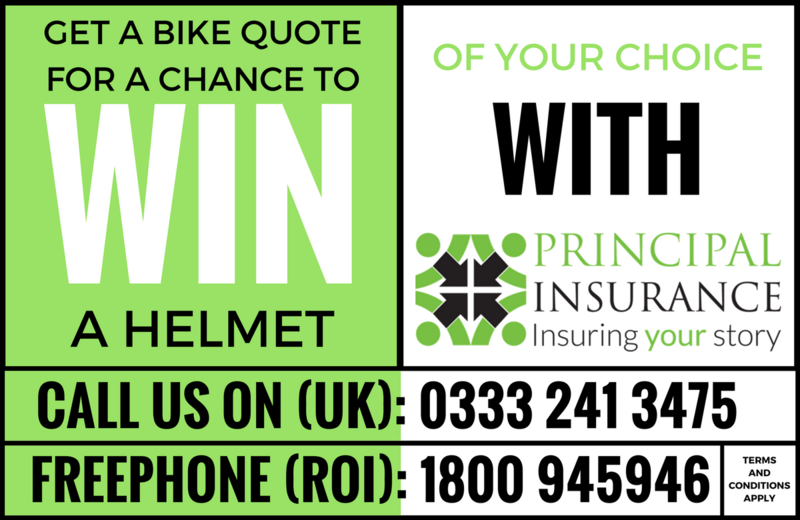 If you have any questions about how to enter or in connection with the Prize Draw, please e-mail us at customerservice@principalinsurance.co.uk with “Helmet Prize Draw” in the subject line. Principal Insurance accepts no responsibility is taken for entries that are lost, delayed, misdirected or incomplete or cannot be delivered or entered for any technical or other reason. Proof of delivery of the entry is not proof of receipt by Principal Insurance Limited. The closing date of the Prize Draw is 23:59 on 28 February 2017. Entries received outside this time period will not be considered. The winner will receive a motorcycle helmet of their choice up to the value of £500 – from the following list: Arai, Agv, Airoh (Flip Front Only), HJC, Box, Shoei, Shark, Spada, Nolan, X-Lite, Caberg. The winner is not entitled to a refund for any helmet chosen under the value of £500. Principal Insurance Limited accepts no responsibility for any costs associated with the prize and not specifically included in the prize. The winner will be notified by email on or before 17 March 2017 and must provide a postal address to claim their prize. If a winner does not respond to Principal Insurance Limited within 14 days of being notified by us, then the winner’s prize will be forfeited and Principal Insurance Limited shall be entitled to select another winner in accordance with the process described above (and that winner will have to respond to notification of their win within 14 days or else they will also forfeit their prize). If a winner rejects their prize or the entry is invalid or in breach of these Terms and Conditions, the winner’s prize will be forfeited and Principal Insurance Limited shall be entitled to select another winner. The prize will be sent to the winner by Principal Insurance Limited by post. Principal Insurance Limited retains the right to substitute the prize with another prize of similar value in the event the original prize offered is not available. The winner may be required to take part in promotional activity related to the Prize Draw and the winner shall participate in such activity at the reasonable request of Principal Insurance Limited. The winner consents to the use by Principal Insurance Limited and its related companies, both before and after the closing date of the Prize Draw for an unlimited time, of the winner’s voice, image, photograph and name for publicity purposes (in any medium, including still photographs and films, and on the internet, including any websites hosted by . Principal Insurance Limited and its related companies) and in advertising, marketing or promotional material without additional compensation or prior notice and, in entering the Prize Draw, all entrants consent to the same. Principal Insurance Limited accepts no responsibility for any damage, loss, liabilities, injury or disappointment incurred or suffered by you as a result of entering the Prize Draw or accepting the prize. Principal Insurance Limited further disclaims liability for any injury or damage to your or any other person’s computer relating to or resulting from participation in or downloading any materials in connection with the Prize Draw. Nothing in these Terms and Conditions shall exclude the liability of Principal Insurance Limited for death, personal injury, fraud or fraudulent misrepresentation as a result of its negligence. Principal Insurance Limited reserves the right at any time and from time to time to modify or discontinue, temporarily or permanently, this Prize Draw with or without prior notice due to reasons outside its control (including, without limitation, in the case of anticipated, suspected or actual fraud). The decision of Principal Insurance Limited in all matters under its control is final and binding and no correspondence will be entered into. Principal Insurance Limited shall not be liable for any failure to comply with its obligations where the failure is caused by something outside its reasonable control. Such circumstances shall include, but not be limited to, weather conditions, fire, flood, hurricane, strike, industrial dispute, war, hostilities, political unrest, riots, civil commotion, inevitable accidents, supervening legislation or any other circumstances amounting to force majeure.